EVERYWHERE SIMON TEMPLAR LANDED, he seemed to attract trouble. It was the sort of life to which he had been accustomed, and the quietude that other men had would have seemed deathly dull, about as interesting as the daily trials of the customs officer whom he faced. There was no point in being cavalier nowadays. While in the past Simon might have quipped about how he was carrying cut flowers and wines in his luggage, such lightheartedness would bring upon bored security guards with very little to do but gain satisfaction from delaying a passenger. It would only detract from the greater adventures at hand, and Simon Templar was not one to miss those. And while a fight with mere guards might be entertaining, he had no desire to meet Chief Insp Teal of the Metropolitan Police just yet, at least, not till the caper was well advanced. A premature and immediate arrest was not in the Saint’s interests. No caper, however, could take place without the right steed, and the Saint thought to the times in the Hirondel. There were, too, those many years in the loyal company of his Volvo 1800, the passenger seat of which had availed itself of many a delightful companion over the years. He had hoped there would be such a car awaiting him outside the airport, but Volvo had arranged something very different in the hope that it would encourage the Saint to be of its custom again. It was the right colour, he remarked to himself, as he wheeled his airport trolley toward a vehicle that was considerably taller and larger than any to which the licence plate, ST 1, had been affixed. And there would be little problem putting in the luggage of any traveller who had the necessities that Simon Templar had, a problem he sometimes encountered in the 1800. 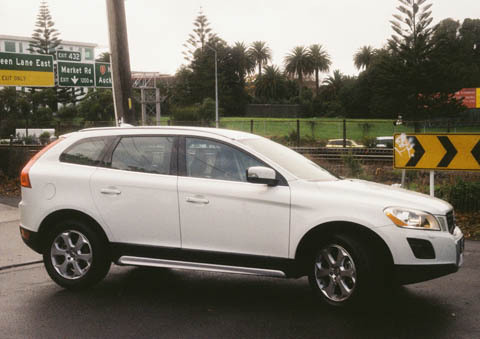 What he did not expect, however, was the XC60 diesel SUV that confronted him. He put his matching suitcases in the boot, and dumped his raincoat on to the back seat. He looked idly at the SUV: it was pleasant enough and there had been a great deal of thoughtfulness that had gone in to those sculpted lines. Climbing in—or across, since the car was a great deal higher than what Simon was accustomed to—his cool blue eyes looked directly at a well thought-out fascia. ‘Now, I wonder how she goes,’ the Saint thought to himself, as the Volvo moved forward. The performance was certainly there. The 2·4-litre D5 diesel was torquey, more so than one might expect from a large vehicle. Volvo had said this was a compact model, but it was mere millimetres narrower than the XC90, one that the Swedes had regarded as too large for its own roads. Simon pressed firmly on the accelerator to move the heavy car forward in its maiden voyage, which it covered with a quiet hum, but the economy figures left something to be desired. Thirty-four miles per gallon, read the trip computer—and the brochure, which he once glanced with curiosity, said the carbon dioxide output exceeded 200 g/km. It was time to drive more calmly, rather than put the SUV’s collision avoidance feature to the test. It dawned on the Saint why Volvo had picked this very car. Simon Templar had thrown one of the many villains, who had decided to take his chances with him, against the bonnet of the 1800. During one visit to the company for its service, he had made a throwaway comment, the sort that he would deliver regularly, about how much time a man would lose to his car being off the road. Not only should the cars’ paintwork be of higher quality, it might be useful for them to avoid obstacles, to stop errant drivers from hurting themselves. 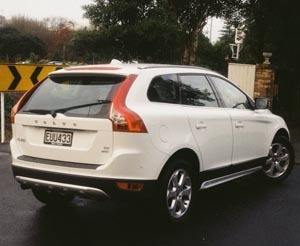 The man at Volvo assured him that the XC60 would do just that: it was a car that could avoid accidents by itself. Perhaps, then, it might have been better suited to the likes of Claude Eustace Teal, who seemed to have had a greater share of accidents in the Met’s police cars than any other officer he knew. The Saint drove the Volvo to the north side of Piccadilly, to a garage that he used, for an apartment which he used regularly in his London adventures. And therein lay another problem: the width of the car. The space was wide enough, but it left so little room for the driver to alight that the Saint wondered what he might do if he had to make a quick getaway. It was a smarter looking car than its nearest competitors, and it was the most comfortable, the sort of qualities that might impress Miss Patricia Holm. 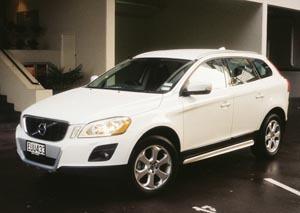 Get quick facts on the Volvo XC60 and other models at Autocade. With apologies to the estate of Leslie Charteris. Jack Yan is publisher of Lucire.